I’ve always enjoyed the conundrum of time travel. In fact, Ray Bradbury’s story “The Sound of Thunder” is one of my all-time favorite short stories. (Hmm. Apparently I’m trying to use the word “time” as many times as possible.) When I first read Bradbury’s story, I hadn’t yet studied chaos theory and the butterfly effect, but it seemed logical that one small change millions of years ago would make a difference to us today. Oddly, in the story, everything was still the same in our world after the misstep, though the language was different and a dictatorial candidate won the election instead of the more egalitarian choice. Despite that seeming contradiction, I enjoyed the story and the ensuing mind calisthenics. The way I figured it, since the changes were so minor, it’s just as possible that the dead butterfly affected the passage of the time machine rather than the passage of time itself, and the travelers ended up in an alternate universe. 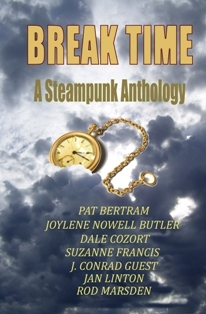 If you are a time travel buff, be on the lookout for Break Time. Meantime, check out “Time’s Winged Chariot,” Rod Marsden’s phenomenal article listing time travel movies, books, comics, and television shows.